Kootenay Lake shoreline and beaches ? The Kootenay Lake is the largest natural ice-free freshwater lake in BC. However, it is one of the least inhabited lakes in BC. This makes the Kootenay Lake seem mysterious. Being underdeveloped can also make accessing the shoreline a bit of a challenge sometimes. The lake water is very clean and pure (there may be localized organic silt from seasonal run off near rivers). Most lake residents get their drinking water straight out of the lake. The Kootenay Lake is glacier fed. Even though this sounds cold, the water is lovely to swim in during July and August, and even into September. Last summer the water temperatures were often neared 80F (at the south end of the lake). 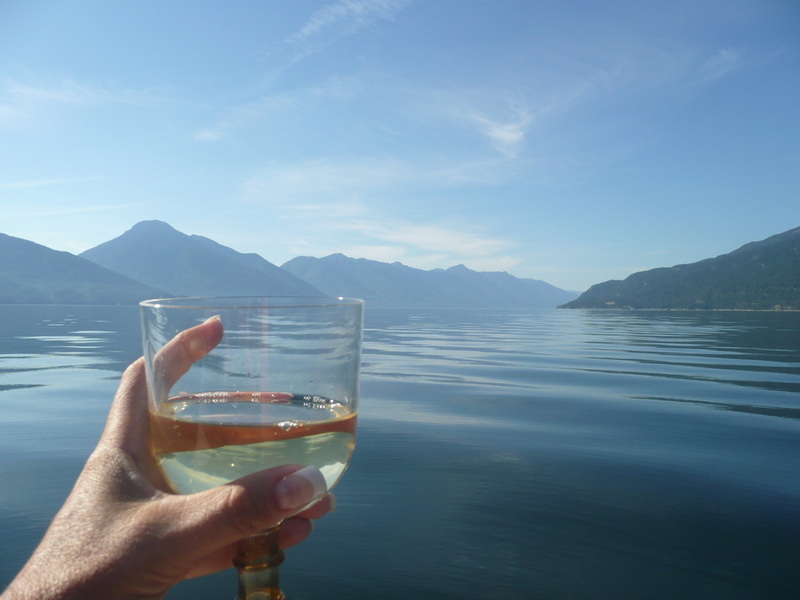 The west shore of the Kootenay Lake, across the lake from Kuskanook, is accessible by boat. One section, called Tye, is accessible by private logging road (off of the Kootenay Pass section Hwy 3). There are spectacular sandy beaches on the west side of the lake to enjoy. Highway 3A follows much of the Kootenay Lake east shore starting just before Kuskanook and ending at the Kootenay Ferry Landing at Kootenay Bay. The road also continues north of Kootenay Bay to the town of Riondel and a bit beyond. Highway 3A from Creston to Kootenay Bay is recognized by Destination Highways BC as the number one motorcycle road in BC for good reason. With every twist and turn (there are many) of the double lane road you will notice spectacular views of the lake. The trick is how do you get to the water. Much of the road passes by cliffs, trees and private residences. Below tells more about how to enjoy this lake. Presently, there is only one Provincial camping park on this side of the Kootenay Lake and a couple community parks. This beach park and campground is located half way between the Kootenay Lake Ferry Landing and Creston. Lockhart Beach and Camp Ground has an expansive scenic beach that is ideal for families to enjoy. There is a camping rec site located beyond Riondel called Garland Bay. There is also a beach camp ground at Riondel that is run by a non-profit society. A lovely Provincial Marine Park is located at Pilot Point near the Kootenay Ferry Landing. There is also crown land (public access) along the lake. However, it is difficult to differentiate what is crown land and what is private land from the roadside. Identifying crown land can be done by visiting http://www.rdck.ca/EN/main/services/mapping-gis.html . Fortunately, there are public lake access points along the lake that are accessible to most people but may not accommodate the needs of the mobility challenged. Most of these sites, with their beaches, have not been developed and are not easy to spot from the highway. They have rugged shoreline access trails, no bathrooms or garbage cans. Beautiful beaches on the west shore of the south end of the Kootenay Lake are only accessible to the public by boat. Kuskanook Harbour has a public boat launch site. People who visit these sites are encouraged to help take care of them by packing out garbage. Just in case there is garbage please bring along a garbage bag. Nature and fellow users will be happy you helped out. Each site has its own unique qualities. Some are also good for fishing from the shoreline. Local residents, along with the Creston Valley Trails Society, are in the process of encouraging authorities to support the development of a couple more parks on this side of the lake. The intent is to have these parks be both environmentally wise and capable of accommodating people’s soft recreational needs. Until then this magnificent pristine lake can still be enjoyed in its raw natural state. Visit www.crestonvalleytrails.ca for directions and coordinates to the public lake access sites.